Part one in a two-part series on whether arguments for the pipeline expansion are based on actual respect for legal procedure. I can’t believe I’m writing this, but it appears that our New Age prime minister has embraced the post-truth era quicker than anyone could have imagined. Quite simply, he is imitating U.S. President Donald Trump in his handling of Kinder Morgan: tell a big lie­­ and repeat it frequently. Attack any opponents as anti-prosperity, and their words as “fake news.” Unfortunately for Canadian democracy, the cynical “big lie” propaganda technique is now becoming the go-to-procedure in Ottawa for all things Kinder Morgan. Not surprisingly, the pro–Kinder Morgan crowd that has been attacking the B.C. government and other opponents with “rule of law” arguments has been silent in response to these rigging allegations. If they really cared about the procedural fairness that Canadian laws are founded on, they should be the ones calling most loudly for a thorough investigation of the federal approval process (more on the new evidence of improper process later). Alberta’s Premier Rachel Notley, who in what might go down as the biggest political blunder in decades allowed Kinder Morgan to become the litmus test for the success of her government, has the biggest serial spewer of “rule of law” blarney, doubling down almost daily with misguided references to support her threats to ban wine sales and cut off B.C.’s oil supply. This week she referenced it once again to justify her decision to skip the recent first ministers meeting in the Yukon. 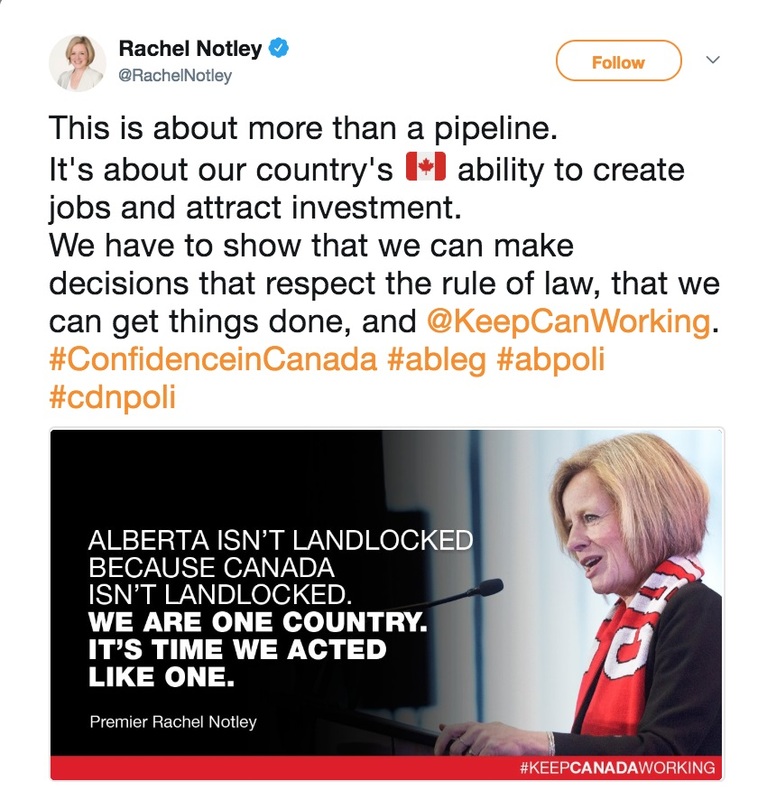 Alberta Premier Rachel Notley’s tweet this week. Screen grab from Twitter. As then, so today. Until the new allegations of NEB rigging surfaced, Kinder Morgan’s promoters often referred to the “rule of law” as their rationale for moving ahead quickly with the Texas company’s controversial oil tanker-pipeline proposal. Canada is not a dictatorship. Just because some handpicked board rubber-stamps something, or princely Trudeau (or the bully Harper before him) wants something, it doesn’t mean we all have to march in step to make it so. What Harper, Trudeau and the pro-oil sycophants ignore is the fact that the Canadian system of law depends on the complex interplay of a wide range of institutions: police; courts; political parties; non-partisan civil servants; independent regulators; and legislatures. Each of these institutions must be perceived as genuinely independent and not beholden to private interests. They each must be impartial, loyal to the broader public interest and obedient to the rule of law. The NEB recommendation and cabinet approval are just two steps in a process to ensure the rule of law is upheld. Enbridge’s now-defunct west coast oil-port proposal provides a cautionary tale of thinking otherwise. Like Kinder Morgan’s controversial proposed oil port expansion in Burnaby, Enbridge garnered a positive NEB recommendation (with conditions); it received both federal and provincial environmental assessment certificates, and then it got the thumbs up from cabinet in Ottawa. On the surface, it all seemed proper. Yet two separate courts ultimately struck down these recommendations and approvals. The courts determined the processes were fundamentally unfair because they failed to uphold government’s constitutional obligations to First Nations. The true rule of law — not the conveniently fictional one that Harper and the oil industry cited — eventually prevailed in the courts, thereby killing Enbridge’s proposal. Trudeau and his cabinet claim, as Harperites did with Enbridge, that the “federal review of the Trans Mountain expansion was the most exhaustive in the history of pipelines in Canada.” But in determining whether the rule of law is being upheld, our legal system looks at the quality of the process, not just the quantity. Upon closer legal examination Enbridge failed this test, and, given the similarities, there are strong reasons to believe Kinder Morgan will fail as well. The shortcuts and flaws in the NEB review of Kinder Morgan are well known. The Trans Mountain NEB review is haunted by the exclusion of many affected people and groups, the limited terms of reference, the lack of cross-examination to test the evidence Kinder Morgan submitted, the exclusion of relevant evidence (such as scientific studies concluding bitumen sinks if spilled), the expedited hearing schedule and conflicts of interest. Trudeau and the Liberal Party’s pre-election criticisms of the NEB review process was not unique; they were shared by virtually everyone — First Nations, municipalities, scientists, and property owners — who voiced concerns about the proposal. Concerns about the NEB’s Kinder Morgan review being rigged surfaced even then. It is also worth noting that the NEB’s review of Enbridge — although ultimately determined to be fundamentally flawed by the courts — was much more thorough than their review of Kinder Morgan. Affected people, organizations, witnesses and evidence, excluded in the NEB review in Kinder Morgan, were permitted in Enbridge’s review, and the Enbridge process was not artificially truncated by Harper’s later gutting of environmental laws in 2012. That gutting occurred before the Kinder Morgan review. Natural Resources Minister Jim Carr appointed an ad-hoc ministerial panel to make it appear Trudeau’s government was fulfilling its election promise to “redo the review.” The panel’s controversial make-it-up-as-you-go-along meetings were haunted by serious conflict of interest issues. Yet despite all its problems the ministerial panel surprised everyone and recommended that the Trans Mountain pipeline proposal not proceed without a serious reassessment of its impacts on climate change commitments, Indigenous rights and marine mammal safety. Trudeau and his cabinet gave the project the thumbs up just over three weeks later without addressing any of their own panel’s recommendations. If Trudeau’s false promises weren’t enough to threaten the legitimacy of the federal Trans Mountain approval process, we are now hearing credible reports — with documents and several government staff whistle-blowers — describing how Trudeau’s government instructed staff to put their thumb on the scale of justice. Reportedly, Erin O’Gorman — the then-associate deputy minister of the major projects management office — was instructed to “find a way to approve Kinder Morgan.” O’Gorman then reportedly told various departments to do just that. In other words, it appears Trudeau betrayed not only his “Sunny Ways” promises, but violated a host of laws by predetermining the Kinder Morgan approval before all the evidence was in, or consultations with affected First Nation were completed. As biased as the federal process was, the provincial approval process was arguably worse. Back in 2010 while Gordon Campbell was B.C.’s premier, his government signed an equivalency agreement with Ottawa that allowed an NEB review of major proposals like Kinder Morgan to substitute for the provincial assessment. In 2016 the B.C. Supreme Court accepted the Gitga’at/Coastal First Nations argument that the B.C. government acted improperly when it abdicated to Ottawa its responsibility for assessing the environmental impact of the proposed Northern Gateway pipeline. The court declared the environmental assessment certificate invalid. This created serious problems for Kinder Morgan, which was also covered by the equivalency agreement. Then-Premier Christy Clark’s lawyers condemned the truncated NEB review of Kinder Morgan. Ultimately, her government officially opposed Trans Mountain, citing concerns about oil spills. Although no new evidence was introduced, the Clark government later flip-flopped and endorsed Trans Mountain after secret negotiations with Ottawa. Rumours abound that Clark’s flip-flop was payback for securing Trudeau’s approval of both Site C and Petronas’s now-defunct Pacific Northwest LNG export proposal near Prince Rupert. But Clark’s flip-flop opened the door to another challenge by First Nations of British Columbia’s abdication of provincial review due to the equivalency agreement. As with the recent allegations of rigging of federal approval, some B.C. government employees allege that Clark’s government instructed staff to expedite a “Gitga’at–proof” provincial review of Kinder Morgan. Instead of initiating a rigorous process, as a shortcut, the B.C. reviewers accepted all the evidence Kinder Morgan had submitted to the NEB — evidence the province’s own lawyers had previously criticized as inadequate during the NEB review — and deemed that evidence as satisfying their obligation to conduct an independent provincial review. Some public servants objected and reportedly were taken off the file. After a few cursory meetings with affected First Nations, Clark’s government granted the provincial environmental assessment certificate. Talk about an epic rubberstamp. Who’s really afraid of the rule of law? Ironically, when all the evidence is in, it is Kinder Morgan’s cheerleaders, not opponents, that actually are undermining the rule of law. Their get-an-approval-by-any-means-necessary approach — by rigging review processes, ignoring conflicts of interest, trying to pre-empt review by courts, generally putting their thumb on the scales of justice, and using “big lie” propaganda techniques — is the real threat to the rule of law. But luckily the rule of law doesn’t just include politicians, legislatures, ministers and the courts. Citizens have a critical role to play as well. More on that in part two.